Clinton-Sanders: Maybe That’s the Ticket It could keep the party together, at least for this year, and deny an opportunity to Trump. A significant part of the base is going left. Bernie Sanders took off because they want a socialist. The party is going left for a host of reasons: the crash of 2008, economic strain, eight years of President Obama, trends within American culture and education. Hillary Clinton’s struggles this year are connected in part to her ideological unreliability, to the sense that she’s a generation behind ideologically, that she’s got the wrong attitude toward Wall Street and the use of military power. She’s old school; we’re entering something new. It doesn’t get much uglier than that. At issue, procedures surrounding the delegate-selection process and Sanders supporters’ claim that the deck was stacked against them. This was the local expression of a larger national argument over whether the Democratic National Committee and its chairman, Hillary friend Debbie Wasserman Schultz, were, as Donald Trump used to say, rigging the system. The Democratic divide can be seen in other ways. Dante Chinni of this newspaper took a dive into the demographics of Kentucky, whose primary this week “shows how deep divisions are within the Democratic Party.” A racially diverse segment, “located in cities and their surrounding suburbs, is largely behind Mrs. Clinton, while a less-diverse and largely rural part of the party backs Sen. Sanders.” Mrs. Clinton won narrowly, carrying the most populous counties and most of those with the largest African-American populations, Mr. Sanders the least populous and all the least diverse counties. His voters in Kentucky were rural and white, which was true also in Michigan and New York. “The tensions within the party aren’t likely to lessen,” Mr. Chinni concluded. California votes June 7. A journalist this week speculated in conversation that if Mrs. Clinton underperforms or even loses there, it could be a gift. It will make her desperate. Presuming she goes on to win the nomination, her desperation might prompt her to make Bernie Sanders her vice presidential nominee. Why not? It would hold the party together for this cycle. It would help keep Sanders voters, who often threaten to go elsewhere if Mrs. Clinton is the nominee, in the tent. It would also unsettle Trumpworld. They see Bernie supporters as potential Trump supporters in the general election, and Mr. Sanders as having an appeal that overlaps with their own. They see his outsider mystique and his appeal to the young. Maybe he’d hold Mrs. Clinton hostage on the platform before he would agree to be her vice president. Maybe she’d accept a more left-wing platform to get the vice president she thinks she needs. 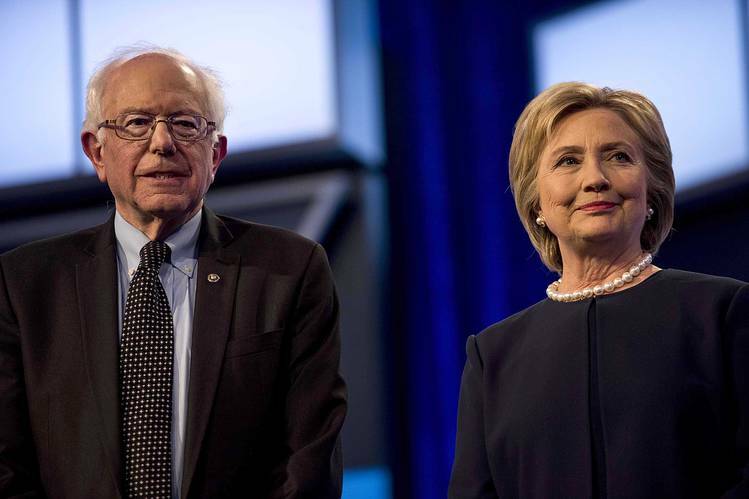 A Clinton-Sanders ticket would be the oldest presidential ticket in U.S. history, totaling a combined 142 years. You can characterize that as ancient and out of it, or you can see it as mature, experienced. Up against Mr. Trump, the latter might not look so bad. Mr. Trump too is looking for a vice president. I don’t understand those who say he should get an attack dog, since he is an attack dog. He doesn’t need a dramatic Northeastern governor with a reputation as a bully, he already has a reputation as a bully. Nor do I understand why they say Mr. Trump needs someone exciting. He’s quite exciting enough. He doesn’t require someone who can help him with the ins and outs of Capitol Hill. That would be nice and come in handy, but it’s also the kind of talent he can hire as staff. Big ships need ballast to keep the ship upright, to keep it from tipping over when a high wave comes. Ballast is by its nature uninteresting. Mr. Trump needs ballast. He would benefit from a solid, uninteresting running mate. Uninteresting would come as such a relief this year. It would be like the old days, when people were boring.